Does your day involve sitting for long periods of time? Like in school, work, transportation, meals, binge-watching your favorite TV shows? 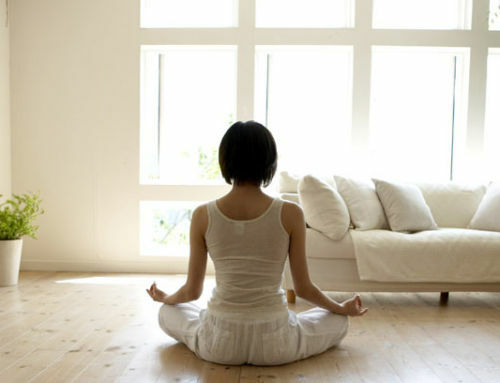 As a result, our bodies are prone to tightness and weakness in ways specific to sitting. The buttock and thigh muscles tend to be weak, and the hamstrings, inner thighs (groins), and calves tighten up. Our bodies are all shaped differently. We also have different ranges in terms of mobility. There are many factors that affect the hip range of motion. Some are susceptible to change, like muscle tightness. Others are more fixed, like bone structure. Knowing this can help us practice with realistic expectations, with an eye to transformation as well as an acceptance of our own unique structures. Tightness in the hip area limits your range of motion, contributes to lower back pain and bad posture. These group of muscles in your hip area consist of your hip flexors, extensors, abductors, adductors, and rotators. They are made up of more than 20 individual muscles. With hips that appear tight, often these muscles are simply in need of stretching. 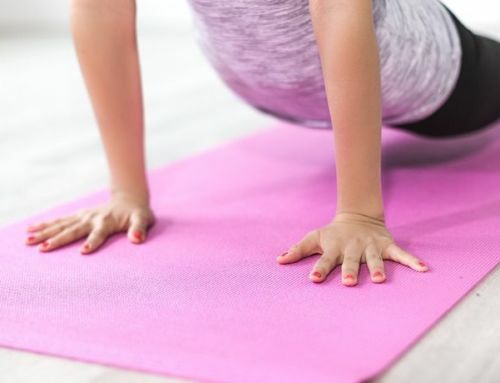 There are some exercises you can try and you can also get into yoga which is a holistic practice that includes a variety of postures that are dedicated to stretching, stabilizing and strengthening all of the muscles in our body. Some benefits of open hips include improved range of motion and circulation, healthy back muscles and spine, and alleviate any tension. Begin from Downward Facing Dog pose. Step the right foot in between your hands. Stack the right knee over your right ankle. Keep the back heel up, bend your back knee just a little. Root down through the whole right foot and ball of your back foot. Draw the belly in and lift the torso up. Put your hands on your hips while you gaze forward. Square the hips to the front of the mat end of the mat. Draw the tailbone down. Slowly straighten the back leg while retaining the position of the hips. Widen through the collarbone and lift the chest up. Option to stay here or raise the arms up to the ceiling. Lift the chest up. Hinge from the hips, and bend forward. Bend your knees a little and bring the chest close to your front thighs. Place your hands by your ankles or behind your calves with your fingers pointing down to the ground. Slowly press the thighs back to straighten the legs. Separate your feet about 3-4 feet apart on the longer side of the mat. Turn the right leg out and align your right knee to your second toe. Turn the left leg in slightly. Bend the right knee about 90 degrees and stack the right knee over the ankle. Stack the shoulders over the hips. Lift the chest up, lengthen the spine, and the neck up to the crown of the head. Face the longer side of your mat and separate your feet about 3-4 feet apart and parallel. Turn both feet slightly in. Place your hands on your hips. Move the elbows closer to each other behind you. Lift the chest up. Hinge from the hip crease. 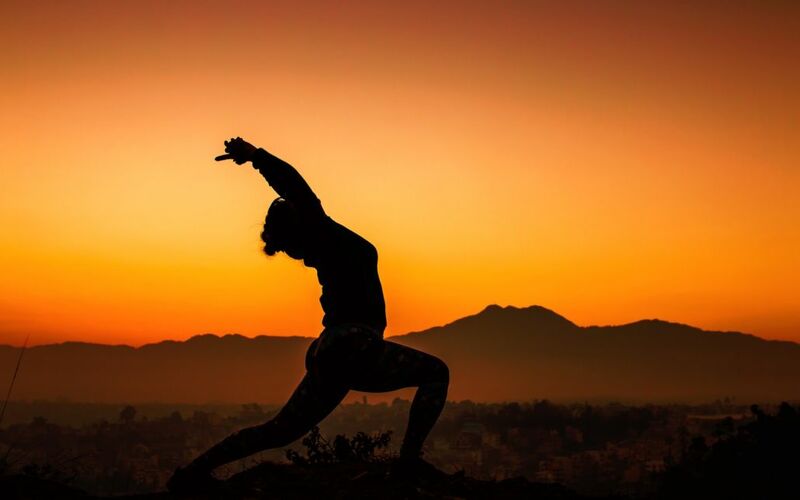 Lead with the chest and bend forward halfway without curving the spine. Place the hands on the mat right below the shoulders. Reach the chest farther down and move the hands in between the feet, still shoulder-width distance apart. Shift more of your weight to the balls of the feet. Relax the neck. Let the head hang. And try to lengthen from the spine, to the neck, up to the crown of the head down towards the mat. It’s okay if the head does not reach the mat. The goal here is to elongate the spine, stretch the hamstrings and adductor (inner thigh), and strengthen the quadriceps. Start from Mountain pose. Step the left foot back about 3-4 feet away. Lower the left heel down. Bend the right knee about 90 degrees and stack the right knee above the ankle. Square the hips to the front end of the mat, and lift the frontal hipbones up to draw the tailbone down. Begin seated on your mat. Bend both knees out to the side and bring the soles of your feet together, heels touching each other and close to the pubic bone. Outer edges of the feet, shins, and thighs, as well as the buttock bones on the floor. Wrap your toes and tops of the feet with your hands. If knees are higher than the hips and you feel discomfort, place neatly folded blankets under the buttock bones to elevate the hips. Lift the chest up, and widen through the collarbones. Lengthen the spine. Lie on your back and hug both knees close to your chest. With your knees still bent, move the knees closer to the underarms. Face the soles of your feet to the ceiling. Clasp the outer side of your feet with your hands. You can keep the arms straight here. To deepen the pose, bend the elbows and lower the knees down by the side ribs. Lie on your back with your legs extended. Separate your feet hip-width distance apart. Bend both your knees and stack your knees above the ankles. Cross the right ankle over to the left knee. Flex the right foot. Reach the right arm through the legs in between your thighs. Start from Mountain pose. Separate your feet wider than hip-width distance apart. Turn both feet out slightly. Bend your knees and lower the hips until the buttocks are down to the level of your ankles. Shift more of your weight into the heels. Track the knees in line with the second toe. Lengthen all sides of the torso evenly. Bring your hands into prayer position in front of the chest. Lift the chest up and widen through the collarbones. Lift the pit of the abdomen up. Lift from the crown of the head. Use a blanket or a rolled up mat beneath the heels if the heels do not reach the floor. Use a bolster or a block beneath the sit bones for more stability. Begin seated on your mat. Stack your left foot over your right knee. Move your right foot forward until it is directly beneath the left knee. Flex both feet. Lift the chest up and widen through the collarbones. Lengthen all sides of your torso. Hands by your side. This may already be plenty for some. These postures can be done at home or wherever you have some space for your mat. 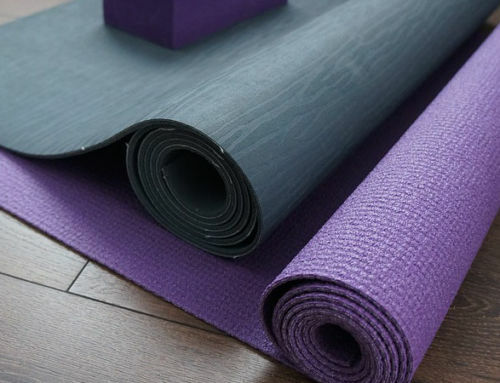 So the next time you notice that you’ve been sitting for long periods of time, take a break and unroll your mat. Remember to breathe through all of these poses. Take your time, go slow. Listen to your body. Trust your body. And enjoy the benefits of healthy and open hips.